HOPLIT F 1100H VPAM 6: The world‘s first effective VPAM-6 head protection. The combination of titanium helmet and shield offers patrolmen effective protection against shots from Kalashnikovs. Schwanenstadt (Austria) / Frankfurt am Main – ULBRICHTS Protection is presenting the first effective VPAM-6 head protection worldwide at the 10th GPEC General Police Equipment Exhibition & Conference in Frankfurt am Main from 20.02.2018 until 22.02.2018. This new protection level is achieved by combining a Titanium helmet (VPAM 3 or VPAM 4+) with a forehead shield. 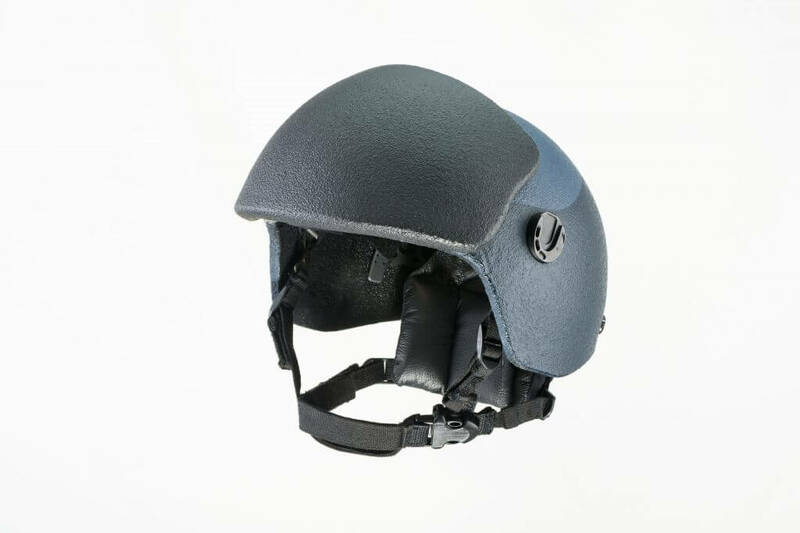 The shield strengthens the helmet shell in the especially vulnerable frontal head area. This system is capable of stopping a projectile from a Kalashnikov and minimising projectile energy so that the helmet wearer is likely to survive the attack. Not only special forces of the police and the military benefit from the new development, but also patrolmen, who have been equipped with ballistic Titanium helmets in many German states recently. Kalashnikov assault rifles are considered a serious threat during terrorist attacks because of their global distribution. The most common ammunition is the extremely powerful calibre 7.62 x 39 iron core, which is assigned to test level 6 (VPAM 6) by the Vereinigung der Prüfstellen für angriffshemmende Materialien und Konstruktionen (VPAM) [Association of Test Centres for Impact-Resistant Materials and Structures]. Due to the enormous projectile energy of weapon and ammunition, effective head protection has not yet been available on the market. “Effective” means not only stopping the projectile reliably. It is just as important that the helmet prevents a fatal injury to the helmet wearer. Experts have defined a residual energy value of 25 joules and set this down in guidelines (e.g. VPAM HVN 2009). This must not be exceeded in ballistic tests, since otherwise there is a risk of irreversible or fatal head injuries. In combination with a titanium or titanium-aramid helmet (hybrid), the newly developed ULBRICHTS shield is capable of reducing the projectile energy of a Kalashnikov bullet (7.62 x 39 iron core) with over 2,000 joules and a speed of around 720 metres per second to well below 25 joules. A frontal head shot is thus survivable. The additional protection weighs around 500 grams and can be fastened or removed within seconds. It is securely attached using a velcro fastener. This technology makes it possible to retrofit all ULBRICHTS Titanium helmets with the forehead shield and thus clearly increase their level of protection significantly from VPAM 3 or VPAM 4+ to VPAM 6. Titanium is the de facto standard in the police sector Titanium has established itself as the de facto standard in the police sector. No other helmet material offers a similarly large effective area of protection against bullets, and no other achieves similarly low residual energy values and such reliable protection against the life-threatening “trauma effect”. In addition, titanium helmets protect the head against further dangers such as blows, kicks and missiles in situations of escalating violence. Helmets made from a titanium-aramid composite (hybrid) offer better splinter protection and a much better bullet and ballistic protective effect than pure titanium helmets. Pure titanium helmets reach a test level of VPAM 3, while the hybrid variants achieve “VPAM 4+”. This means that titanium-aramid helmets will stop the reference ammunition of magnum calibre defined for this test level even at excessive speeds, as well as other relevant impacts. In combination with the now presented forehead shield, both helmet types achieve the VPAM 6 protection level, as well as residual energy values below 25 joules in accordance with VPAM guideline HVN 2009. In the face of new threats, including from international terrorism, 80% of Germany’s federal states have opted for the procurement of ballistic helmets. 90% of these helmets are titanium or titanium hybrid helmets made by ULBRICHTS. Others are currently considering procurement. ULBRICHTS Protection from Schwanenstadt in Austria is a division of ULBRICHTS GmbH. The company manufactures ballistic helmets made of titanium and titanium-aramid (hybrid). Its international clientele includes special police forces, police units and the military. ULBRICHTS Protection is one of the pioneers in the field of ballistic head protection and regularly sets new technical standards in terms of protection, comfort and design. ULBRICHTS Protection with precise technology represents a unique standard of ballistic high-performance helmets in an international comparison. We are happy to provide non-binding information. Our team of experts in the sales and product management departments are available for you.